Introducing Neuro-Anatomical Brain Model 8-part by 3B Scientific. This deluxe brain model is such a great tool for education on the human nervous system and anatomy of the brain. To give you a practical view of what is inside of a human brain, this medially divided brain model presented the critical anatomical structures of the brain and are displayed in the largest in this series of models. 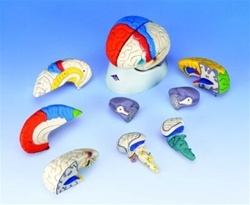 Another interesting feature of this Neuro-Anatomical Brain Model is that the color-coded right half of this brain model highlights systematic grouping of the cerebral lobes, while its left half depicts a gross representation of the pre- and post-central region, speech center and Heschl spirals, brain nerves, and ventricle. This brain model is delivered with a key card that includes detailed explanations of numbered and colored structures. And aside from that, it is also delivered with a removable base for a steady presentation and perfect display on either clinic or school laboratory. EFFICIENT- This brain model is very efficient because it has a systematic colored, systematic grouping for more effective and methodical presentation of the brain’s anatomical structure. ANATOMICALLY ACCURATE- Neuro-Anatomical Brain Model gives you a practically accurate structure of a human brain. This is medially divided and each part systematically groups to providing accurate details of each part. EDUCATIONAL- This deluxe brain is a great tool for education. Especially for beginners and professionals who are studying and teaching human nervous system and anatomy of the brain. COMES WITH A REMOVABLE BASE- This brain deluxe model is delivered with a removable base for a steady presentation and perfect display when not in use. MEASUREMENT & WEIGHT- It has a dimension of 14x14x17.5 cm and weighing 0.95 kg.